First off, HAPPY NEW YEAR! Tip of the hat to you, 2013. You were certainly amazingly epic. 2014, you have a lot to live up to, so best get started. You’re gonna have to wait a lil bit for a recap of last night’s festivities, a) because they just happened and b) because I have to work tonight. So why don’t we rewind to the last major holiday, and reminisce about the amazing 36 hours that were Christmas Eve afternoon to Christmas night? 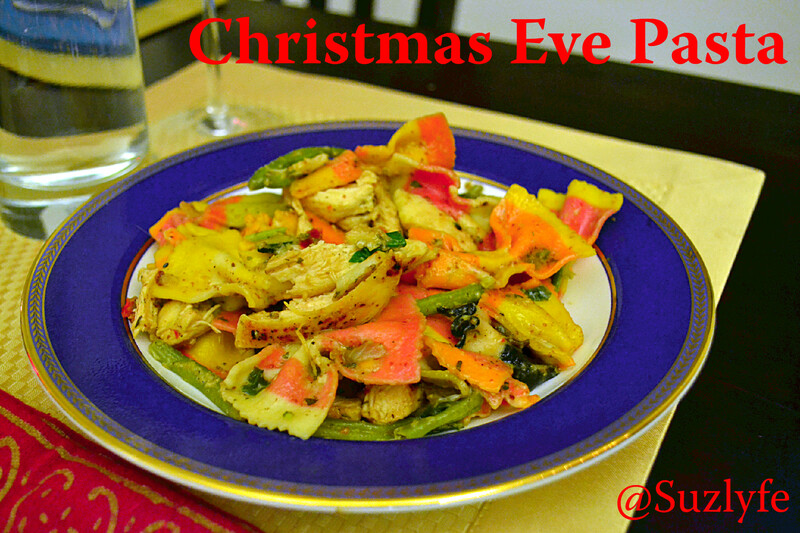 And, natch, let’s do it through the amazing food! 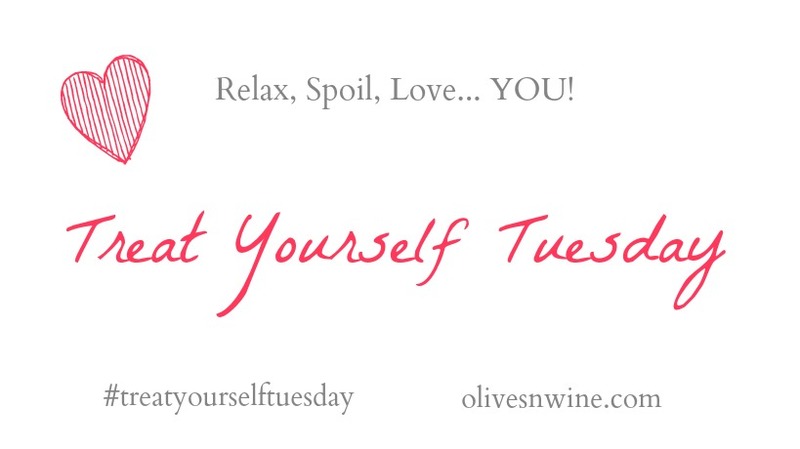 And even though it is a day after, a link up to Treat Yourself Tuesday, because treats know no bounds. 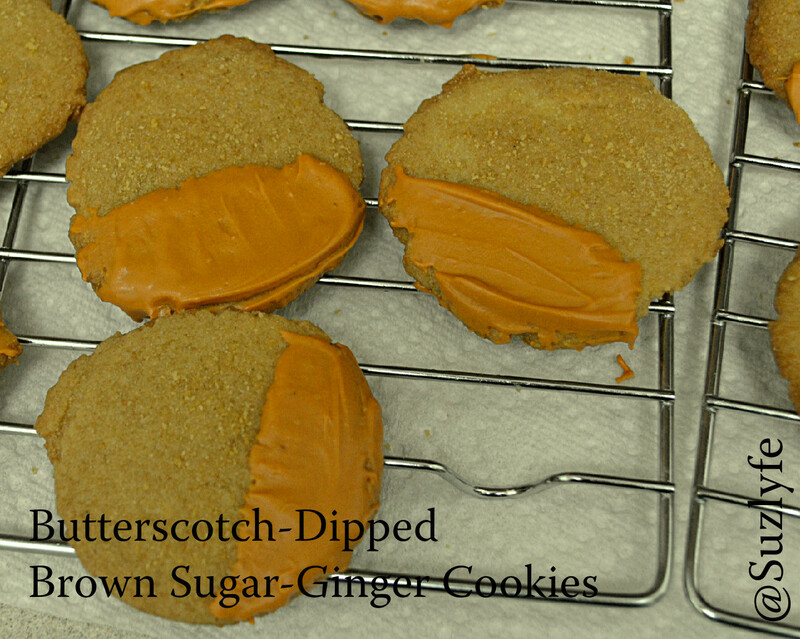 I ate some of the batter and also some of the finished product, so I’m including my Butterscotch Dipped Ginger-Brown Sugar Cookies in WIAW. It’s my blog, I do what I want. These were taken downstairs (obv minus a few “testers”) for our building staff. They are so fabulous–welcoming, helpful, and nearly always upbeat and engaging. They keep everything spick-span and in order, and the building is cleaned within an inch of its life, work is down on schedule (in my experience), and they go out of their way to help. The cookies weren’t much, but they were baked with luuurve. Another thing made with love? 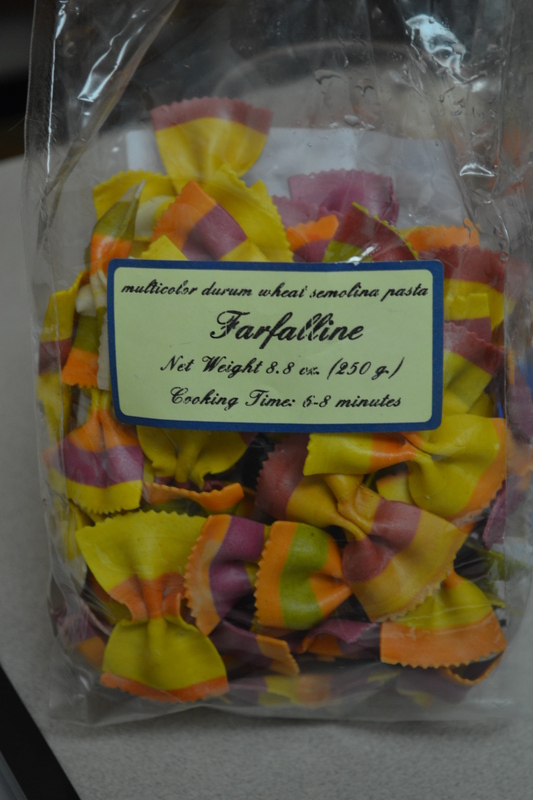 The colorful pasta I made Alex and I for dinner, which we enjoyed with a bottle of Andre Brunel Cote du Rhone Villages, one of my favorites. I love my mustardo–it is never the same, no matter what because I never write down exactly what it is–but it is always a mixture of grainy horseradish mustard, honey mustard, seasonings (usually a little garlic and red pepper), and whatever else I think it needs to balance out. This time, I included a little brown sugar, balsamic vin, basil, and olive oil (I made some sans or very light on the oil for me). Tasted and adjusted as needed. I used super colorful farfalle from Home Goods (I thought it was super festive), Beans so Green from TJ’s (mostly for Alex, I used more fresh cut mushrooms, onions, garlic, and zucchini for me to stretch it out, but you know I took some of that deliciousness), chicken that I pan-cooked after a brief seasoning of salt, pepper, red pepper, and garlic powder, and sundried tomatoes. I also sliced some mozz very thin and tossed into the pasta in lieu of parmesan after I had gotten my share. It was delicious. 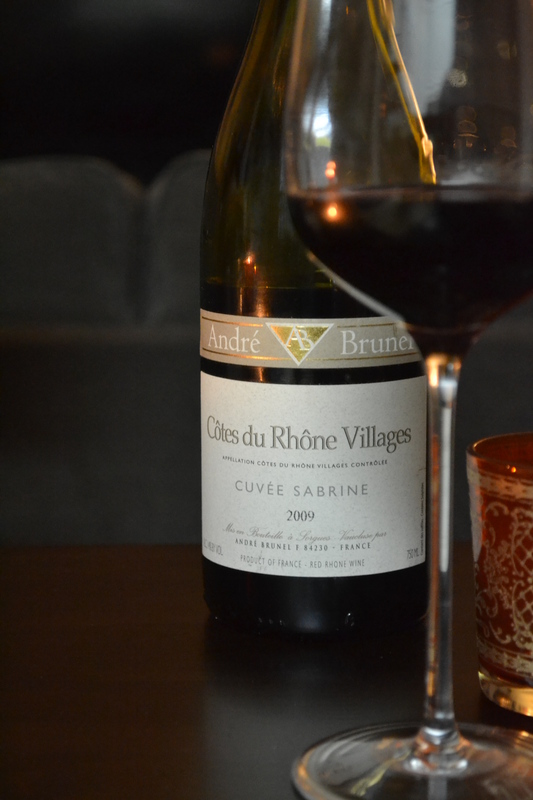 So was the wine. And Ice Cream (duh) later. Christmas morning was another feast of awesome. 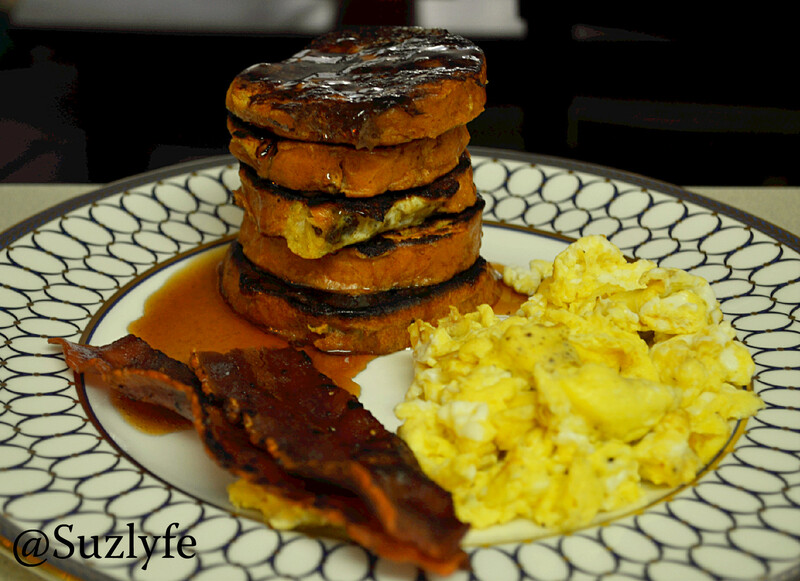 Panettone French Toast, Eggs, Bacon, Pumpkin. And a delicious cup of Coffee. I had Mom save this for me when they moved. It’s from Starbucks in 2006. I also have the Peace one, which is red. But the Noel one is my favorite. We all know that Panettone is yummy on its own, better when warm, and decadent with a little jam and butter. I have found its calling though: French Toast (ironic considering it is Italian, but whatever). I used a mini Panettone loaf from WFM and sliced and dredged that baby in a mixture of egg, milk, butter flavor emulsion (just a dab), cinnamon, salt, and a wee bit of vanilla. I let it really soak in while I got everything else prepped and started the turkey bacon in another pan. Then the magic began. Next door to the FT on the stove I started some eggs after I moved the TB to the oven (set to 200 to keep things warm) and the same with the PFT (hahahaha) as it finished and I was working on the eggs (just eggs, s + p and a little milk in Alex’s, water in mine) and needed more room in the pan for the remaining slices. I also went ahead and put a little butter on the slices to start to sink in. Last touch was heating some maple syrup in the microwave (and poorly-it overflowed rut-roh). Then breakfast was served and enjoyed in pajamas with Xmas music on in the background! For lunch I had tuna, a salad, an english muffin, and greek yogurt, but that is rather unremarkable. After a post-workout yogurt, and taking some TJ’s kettle corn into the theater for Catching Fire (and some nibbles of Alex’s beef jerky, which I love but does NOT agree with me), it was time for SUSHI. Niu is right next to the theater, and when we walked by and saw that it was open, DONE AND DONE. 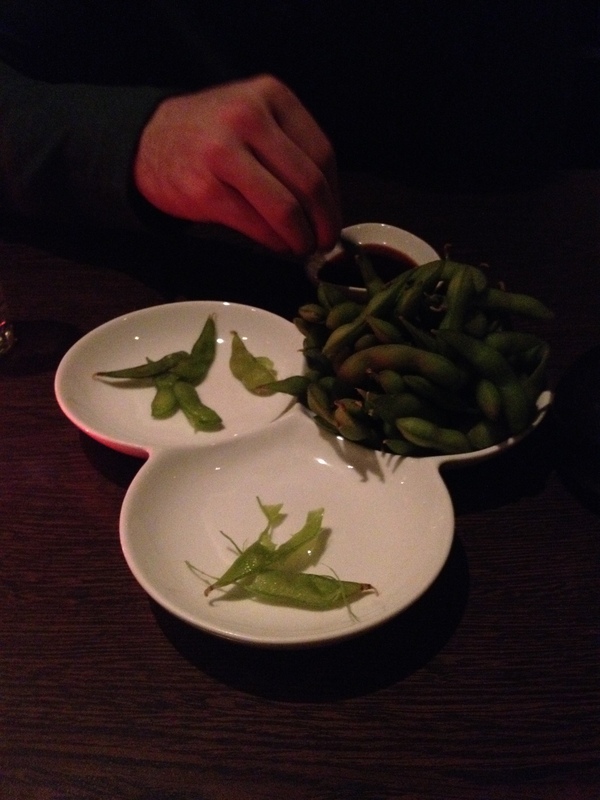 We were starving so we immediately ordered some edamame and the veggie spring rolls (repeat from last time). 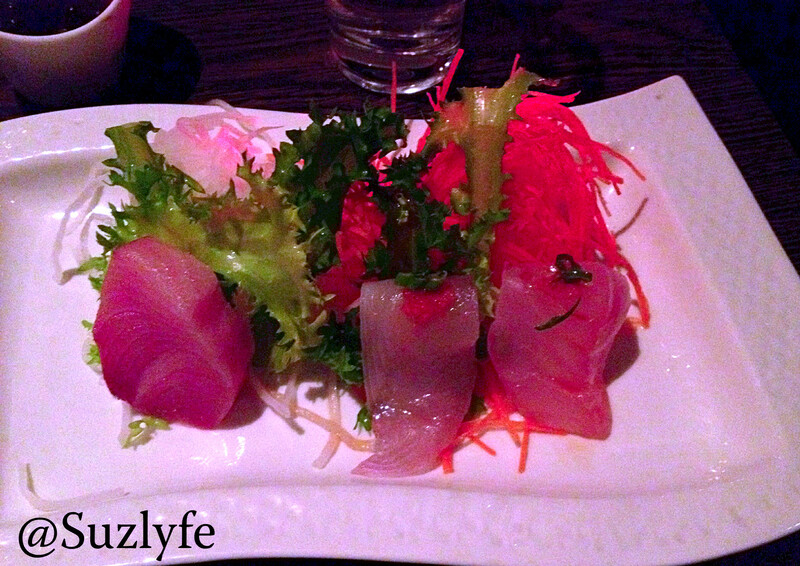 I was craving whitefish sashimi (Hamachi, Fluke, and Snapper). 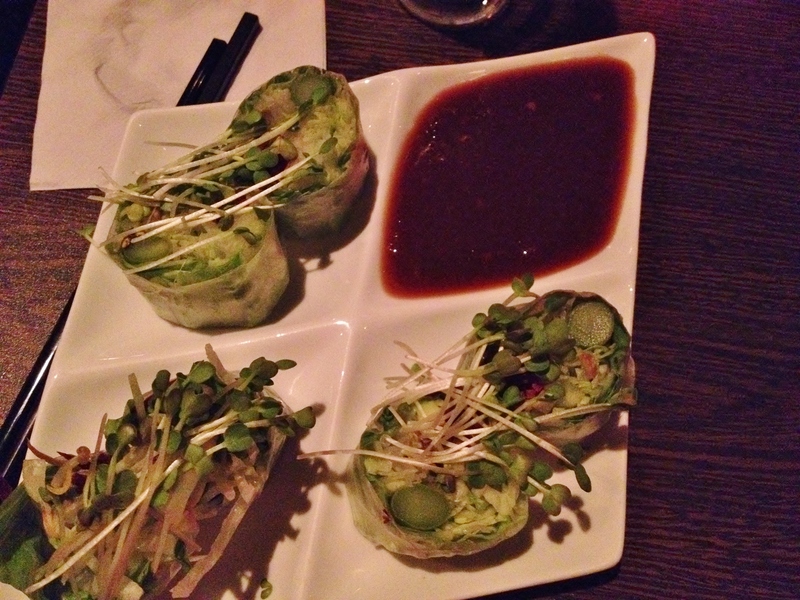 The Hamachi (far left) totally stole the show. I’m just going to stick to it from now on. It literally melts in your mouth unlike any other fish I’ve ever had. And I got a side of Ponzu because it is my favvvvvvvvvvvvvve. I knew that Alex should try the Mellow Yellow Roll as soon as I saw it in the menu. He considered other options, but ultimately, he trusted that the Suz knows best. It was just such an incredible day/days. I am glad to begin the new year with this memory–let the love, laughter, and decadent tastes be forever in our favor! 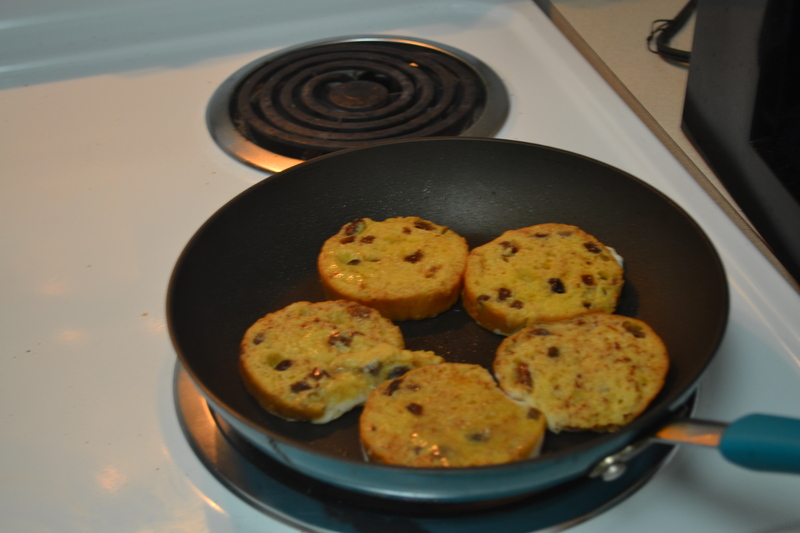 Have you had Panettone? MAKE FRENCH TOAST WITH IT. I’m also thinking Monkey Bread. 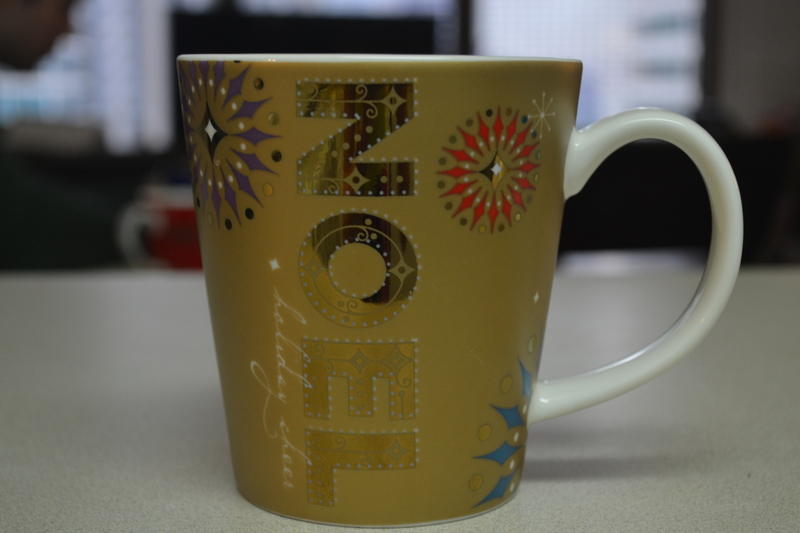 Do you have special servingware for the holidays? Tell me something delicious about your Christmas, other than cookies. Anything creative? Do you cook or go out?